You can enter a supplier's name or create a custom price book such as Xero Items. Next, drag the price book file from your desktop into the box at the top of the screen. You can also click the box to find the file on your computer. You can upload .csv and .txt files. In this example, you can see we matched up the product code to the first column in the CSV file preview, the product name to the second column, and so on. Tip: The cost price is usually the lower of the available number columns. Don't worry if you make a mistake, if things look wrong you can always re-upload the price book at any time. 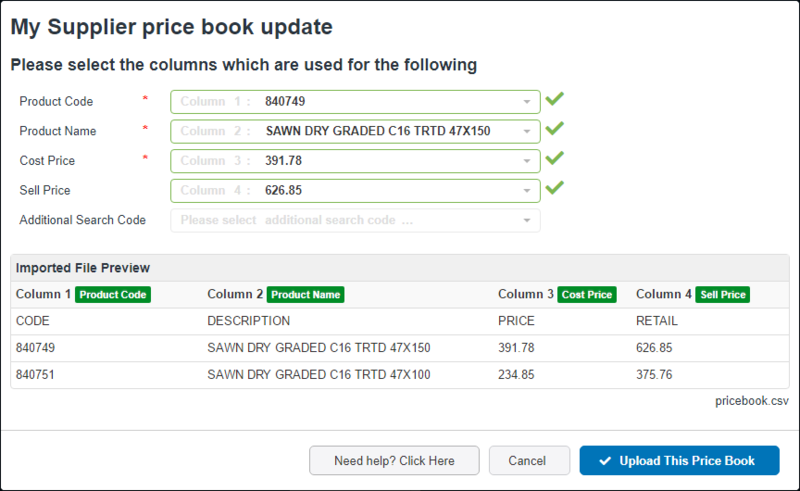 The optional Additional Search Code value can be set to a column that contains keywords you use to search for products. Anything in this column can be used to search for items, but won't show up when you put an item on an invoice or purchase order. Make sure you save the price book file to your desktop before dragging it into Fergus. If your price book is inside a .zip file, drag it out of the zip onto your desktop, and then drag the file from your desktop into Fergus.